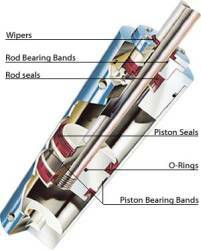 Hydraulic Seals are intended to be used in hydraulic cylinders with reciprocating movements, mainly in industrial applications. The main tasks of hydraulic seals are to retain hydraulic fluids, to exclude solid or liquid contaminations and to maintain the hydraulic pressure. These tasks require a variety of different seal designs and appropriate accessories.